Groover is an advertisement-supported program that can inject advertisements into the web stores you visit. According to the research we have conducted recently, this adware can inject ads indicated as “Ads by groover [random number]” and “Ads by LaSuperba.” Whatever tags are used by this obnoxious infection, we do not recommend interacting with these ads because they could be unreliable. This is the reason we suggest removing Groover; however, getting rid of this adware is not always straightforward. Continue reading to learn what kinds of issues you might encounter when deleting this ad-supported program. It was found that Groover is a clone of such ad-supported programs as Shopperz, Jabuticaba, and Daugava. All of these programs have been found to replace a dynamic link library file called “dnsapi.dll”. Unfortunately, because of this, computer users cannot uninstall these unreliable advertisement-supported programs from their operating systems easily. On top of that, even automatic malware detection and removal tools cannot fix this issue. Fortunately, once you recognize that this Groover has corrupted your operating system, you can fix this issue using a few simple steps that we will discuss in the last section of this report. As you probably know, a website that would represent Groover does not exist. The creators of this unreliable adware have not employed traditional distribution methods that we associate with legitimate programs. Instead, Groover is more likely to be spread by third-party installers, which is what we associate with malware and unpredictable programs. Unfortunately, it is possible that you will have to remove the programs installed along with this adware, as they could be even more unreliable and dangerous. If you are not sure if you need to delete Groover-related malware, download a scanner that will inspect your PC and detect threats for you. Since there is very little information about Groover, we identify it as a very unpredictable program. For all we know, this program could use personal data-tracking technologies and inject malicious ads. Even if the shopping deals showcased by this program are harmless, it is very likely that you can find better deals and save more money using different tools or finding discounts yourself. Groover is likely to be supported by vendors and advertisers whose advertisements/offers you will see, which means that the services may be biased. If you want genuine services, you should delete this adware as soon as possible. Reliable, automated malware detection and removal software can delete Groover, but cannot fix the replacement of dnsapi.dll. Our research team has found that this file is not replaced in all cases, and it is possible that the irritating, unreliable ads will stop flooding your browsers after you uninstall this adware. Of course, if ads keep showing up after you remove Groover (see guide below), you have to replace dnsapi.dll. Follow the instructions below to uninstall this adware and replace the file. Afterward, utilize an automated malware remover to eliminate any remaining threats and ensure that your operating system is protected hereafter. Post a comment below, if you have any questions. Launch RUN (Win+R) and enter Control Panel to open a menu. 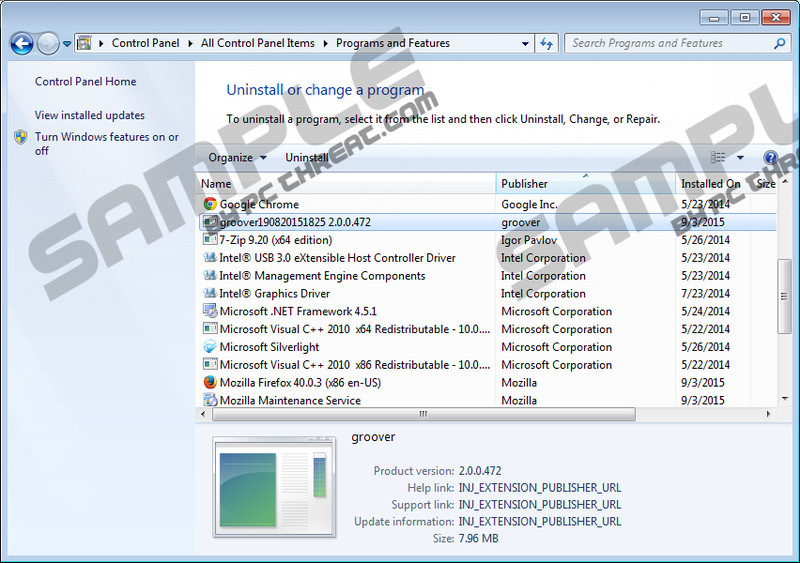 Select Uninstall a program and right-click the unwanted program. Click Uninstall to delete this program. Navigate to the left of the Taskbar and click the Start icon. Type C:\Windows\winsxs into the address bar. Enter dnsapi.dll into the Search box in the top-right corner. Tap Win+E to launch Windows Explorer in a new window. Enter C:\Windows\System32 into the address bar. Transfer dnsapi.dll (the latest version) from C:\Windows\winsxs\amd64... to C:\Windows\System32. Enter C:\Windows\SysWOW64 into the address bar. Transfer dnsapi.dll (the latest version) from C:\Windows\winsxs\wow64... to C:\Windows\SysWOW64. Quick & tested solution for Groover removal.